I’ve been getting a lot of requests for Indian recipes so I thought I would give it a go with my version of a very traditional Indian dish, baingan bartha. 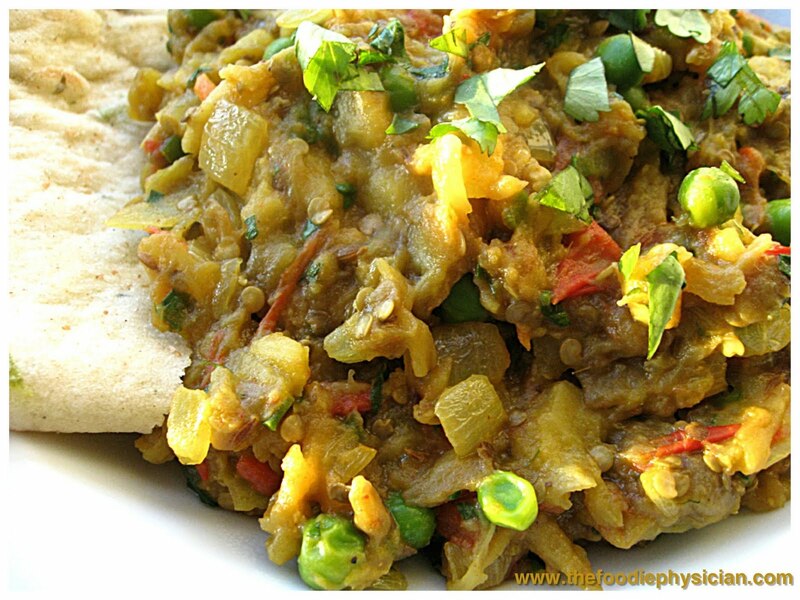 Baingan bharta is an eggplant dish that’s a staple on most Indian restaurant menus. I love eggplant but I find that many eggplant recipes call for deep-frying and it tends to soak up a lot of oil when it cooks. I really like this recipe because it involves roasting the eggplant at a high temperature in the oven instead of frying it. The roasting process eliminates a lot of oil which makes it much healthier and it also imparts the eggplant with a delicious smoky flavor. If you’ve ever been intimidated by Indian recipes or have yet to try one, you may want to start with this dish as it is a relatively simple Indian dish. Simply pop the eggplant in the oven and while it’s roasting, you can prep and chop your other vegetables and spices to save time. Many traditional recipes call for grilling the eggplant over a direct flame but that involves constantly turning it to ensure even cooking so I prefer the oven method. 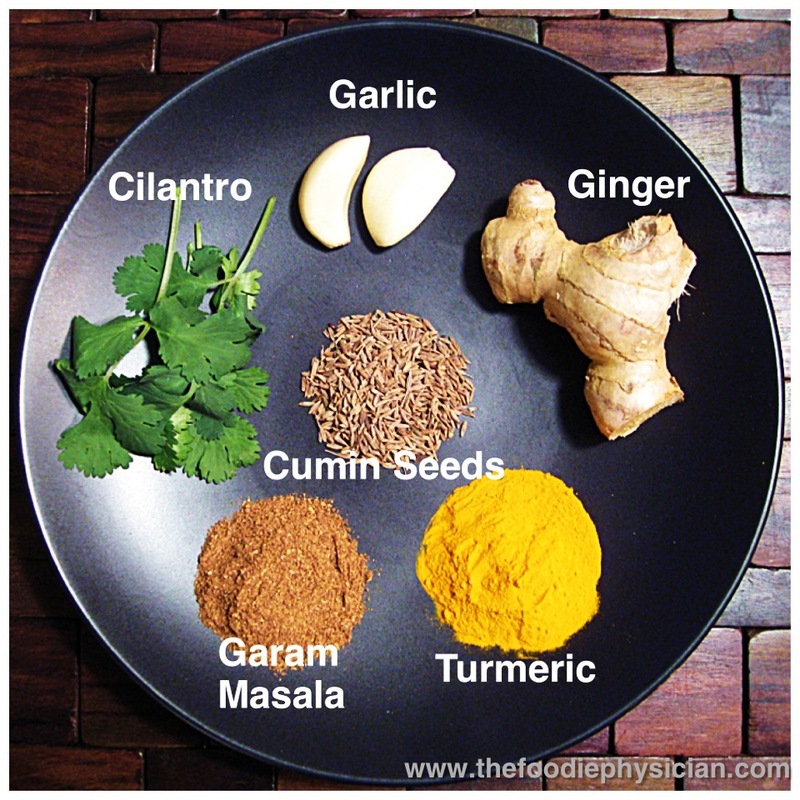 There are a handful of herbs and spices in this dish including cilantro, ginger, garlic, cumin, turmeric and garam masala. Garam masala is a blend of dried spices that is commonly used in Indian cooking. There are probably as many different varieties of garam masala as there are Indian cooks but most of them contain a mixture of spices that include peppercorns, cloves, cumin, coriander, and cardamom. All of these spices can be found in specialty grocery stores and Indian markets. They are also starting to pop up more frequently in traditional grocery stores in the spice aisle. The good news is that once you have all of these spices, you can make just about any Indian dish. Spices are a great way to add a lot of flavor to a dish without adding calories. I like to grate my ginger and garlic with a Microplane zester/grater because I don’t like big chunks of those aromatics in the dish. If you don’t have one, you can puree them in a mini food processor with a little water, or just chop them as finely as you can. You can also buy prepared ginger garlic paste at Indian markets. I have to admit that I got some help from my mom with this recipe- after all, she is a terrific vegetarian cook. But to make it my own, I made two main changes from her version. First, I added tomatoes to the dish for depth of flavor- although many versions of the traditional dish use tomatoes, my mom makes hers without them. Second, I added peas for a pop of color and texture. Hopefully I made her proud! Preheat oven to 400 degrees F. Prick the eggplants all over with a fork. Place them on a foil-lined baking sheet and roast in the oven until the skin is wrinkled and the flesh is soft, 40-50 minutes. Remove the eggplant from the oven and cool. Once cool, peel off the skin and discard. Chop the eggplant flesh and set aside. Heat the oil in a large skillet over medium heat. Add the cumin seeds, which will start to sputter when they hit the oil. After a few seconds, add the onion. Cook, stirring occasionally, until the onions are translucent. Add the ginger, garlic and pepper and cook another minute until fragrant. Stir in the tomatoes, turmeric, garam masala and salt and cook until tomatoes start to soften, 4-5 minutes. If the mixture gets too dry, add a tablespoon of water. Add the chopped eggplant with any juices to the spice mixture and stir to combine well. Stir in the peas, then cover and cook another 6-7 minutes until the flavors are melded and peas are heated through. Adjust seasoning to taste. Stir in the cilantro just before serving. Serve with Indian naan bread or basmati rice (I like brown basmati rice) and Greek yogurt. The tanginess of the yogurt nicely balances the smoky flavor of the eggplant. * Garam masala is a blend of dried spices commonly used in Indian cooking. Most varieties contain a mixture of spices that includes peppercorns, cloves, cumin, coriander, and cardamom. I kid you not I have a big plump eggplant staring at me, asking to be cooked. And I have no idea how to cook it (it was a gift, I have never ever bought or cooked eggplant). I am making this tonight, thank you so much for sharing! Hi Peggy- that's quite a coincidence! Did you end up making it? If so, I would love to hear how it turned out. Thanks! Sonali I made it this morning and it was divine! My 15 year old nephew declared it to be delicious and promptly ate 2 bowls full. Husband loved it too, really nice. Thanks again for sharing, this will become a regular dish in my house (so delicious and yet fuss free to prepare). This sounds wonderful. Thanks for the recipe! QQ sonali. does it matter if you sub in Asian eggplant? Yes, definitely! I love Asian eggplants- they have a more delicate flavor and I think they would work really well in this dish. You could probably reduce the amount of time in the oven since they are usually smaller than traditional American eggplants. Let me know how it goes if you try it! See, I love this dish when out to eat but who knew it could be deep fried? Good to know. I can't wait to give this a whirl but my garam masala is pretty old, may be time for a new batch. Thanks Sonali for the delicious vegetarian recipe!!! I made it tonight for dinner and everyone loved it including Landon (my 2 year old son) who usually does not eat food when it is all mixed together. This will definitely be added to the regular rotation!